Okay, how did it take me three years to find this? 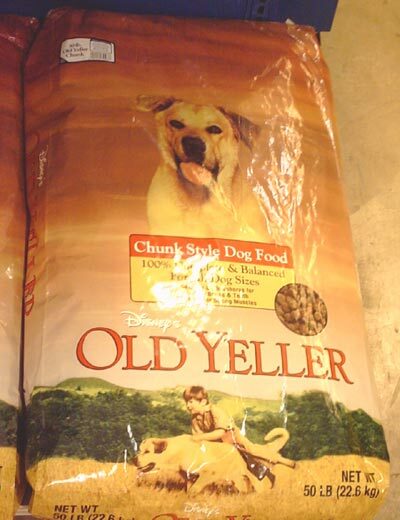 I was walking through the dog food aisle comparing costs of name-brand weight management dog food (damn my stinky-assed dog), when I saw the Old Yeller Dog Food bag. I couldn’t help but let loose a snort. I mean, come on. You couldn’t have used Goofy, Pluto, Lady and the Tramp or the dogs from Homeward Bound? The last thing I want to think of when feeding my lab is the beloved dog at the end of the movie who gets shot by his 10-year-old owner. Nice, Disney. Oh so family-friendly.